I love simply wandering around cities with my camera in hand, stopping whenever I want to take photos. On a recent trip to Perth, the largest city in Western Australia, I had two whole days to myself to explore while hubby had work meetings. 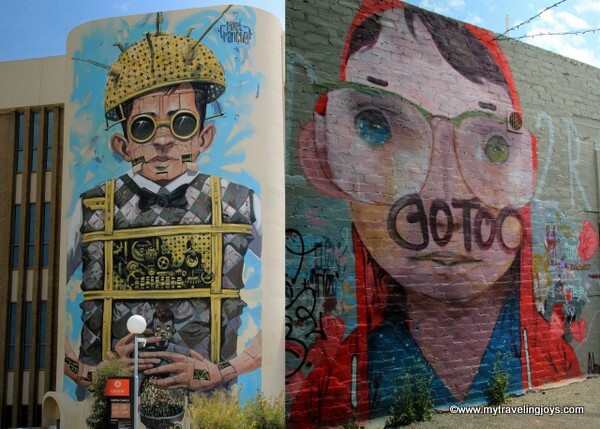 I planned my two days around wandering through the CBD and then the more funky, offbeat neighborhoods of Mount Lawley and Northbridge. When I learned the city was filled with street art, I basically created my own DIY street art tour. I downloaded an interactive map to my mobile phone from Streets of Perth, a website dedicated to showcasing Western Australia's evolving urban art scene. (The website also gives detailed information or links to the artists.) 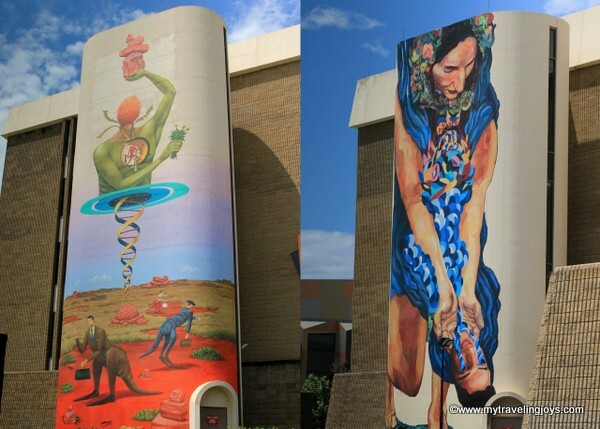 While Perth doesn't quite have Melbourne's street art culture, there are still quite a few areas to discover these large murals adorning the city’s walls. 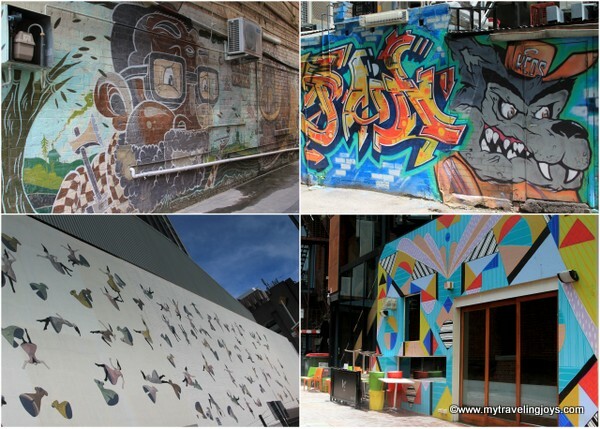 I wandered down unknown streets and laneways, which concealed magnificent street art pieces, often several meters in width and height, and behind skyscrapers, restaurants and small businesses. I followed my map and saw the main sights of Perth along the way. 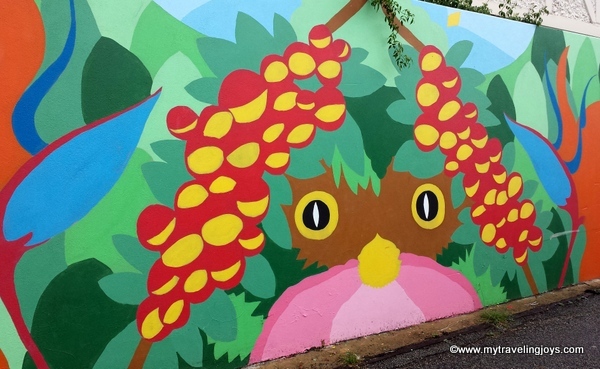 I took more than 100 photos of these colorful murals and selected the 20 best ones to give you an idea of what you can find here as well. Enjoy! My DIY walking tour was a wonderful way to really discover a new city and the creative side of its local artists. Do you enjoy exploring off-the-beat locations too? 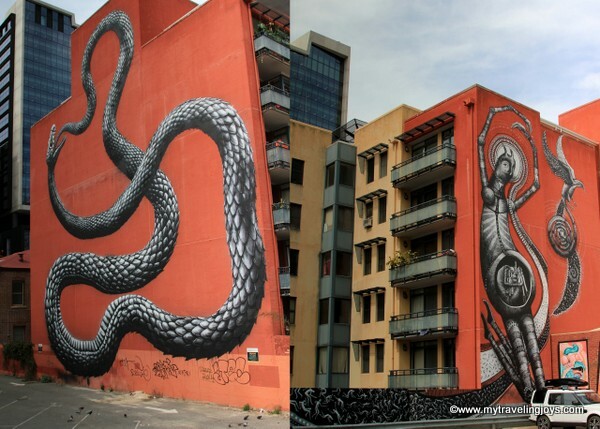 Snake mural by well-known Belgian artist called ROA painted in 2014. Various murals in Perth. Bottom right: Bold mural on Munster Lane by @anyapaintface for @formwa's street art festival in April. 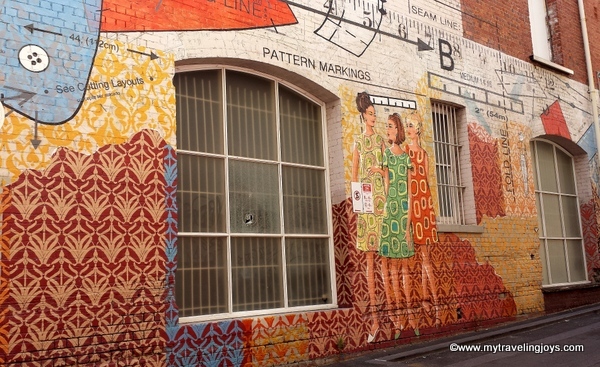 Pretty Patterns in Prince Lane, painted by Australian artists Clare McFarlane & Paul Caporn. The Conversation by @stormiemills in Howard Lane in the CBD. Girl and Butterfly mural, a collaborative effort by local artists, including IdolMotions. This is located on the exterior of Morris House on Pier Street in the CBD. 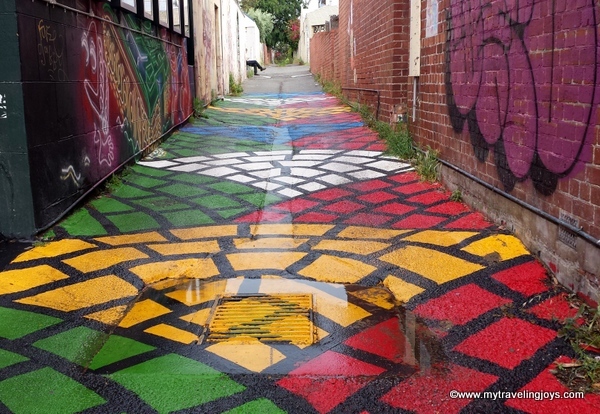 Colourful laneway, located on Beaufort St. between Mary St. & Chatsworth Road, by Perth-based Drew Straker. One of my favorites! Lemon Tree Girl by Paul Deej on 150-meter-long Grosvenor Laneway is one of 30 murals painted by 30 different artists in 2014. Green Goddess on Grosvenor Laneway was painted by @ms_t0nes & @flauntster as part of the “30 Artists, 30 Walls, 1 Laneway” project in 2014. Santa Frida mural depicts Mexican painter and famous self-portrait artist Frida Kahlo, which is also located along the laneway. Unknown artists painted this mural on the Beaufort St. Laundromat’s building. Girl Blowing Leaves, 51 Vincent Street, was a private commission painted by local street artist called The Black Mountains. Beautiful kaleidoscope mural by Perth artist Ian Williams on the wall of the Central Institute of Technology's Gallery Central. "Baba Yaga's Houses" sculpture by Marwa Fahmy in 2011. The artwork was inspired by a character in Eastern European folklore called Baba Yaga, a supernatural being who lives in a hut that stands on dancing chicken legs. 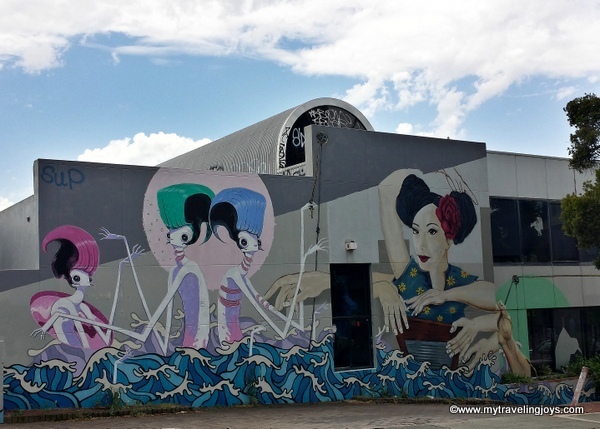 See these quirky characters for yourself on Aberdeen Street in Northbridge. 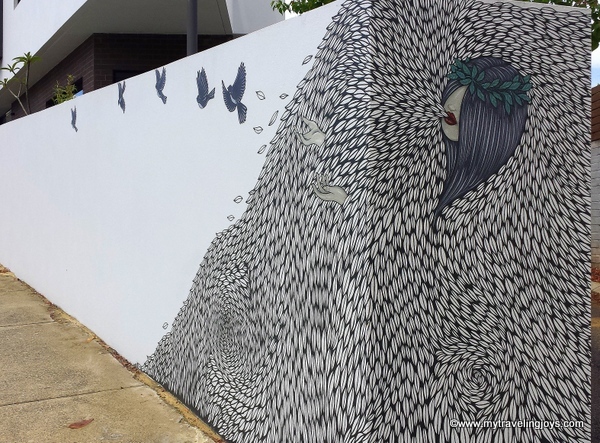 Right: “Migration” mural created by Argentinian artist Ever in 2014. "Border Crossing" by local artist Audrey Fernandes-Satar in 2012, which was commissioned by the City of Perth. Up close, you’ll see beautiful lines of poetry, including: "Between water and land we’d stay, for the rest of our lives. Bodies displaced. There is no going back. I saw tears in her eyes like I’d never seen before, flowing like the ocean and I promised not to leave. Never leave." This larger-than-life Chinese dragon mural is located in a laneway off Roe St. (Nick’s Lane) in Northbridge behind several Chinese and other Asian restaurants. This new mural was painted by Brooklyn-based artists Space Candy and The Yok and local artist Fecks in April 2015. Adorable mushroom mural by @miseryland located at 255 William St. in Northbridge. i love street art. it adds so much to an area. i wish we had more of it here. it's a great way to expose people to art who might never see any otherwise. Thanks Steph! It would be awesome to have you here as well! I love the girl blowing leaves, it adds to the scene rather than dominating it. @Annie, that's a good way to describe it too! What's also cool is that the house was designed by pair of architects and wanted the mural done. Every other day we can see some new art installation somewhere in Perth but the ones that you have here are really some of the more impressive ones! It's wonderful to see you log some of these down before they are painted over though! 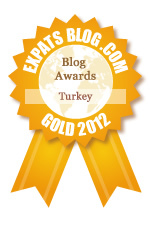 Fantastic blog post! And we're delighted that our map was helpful. :) Cheers and keep wandering, the team @ Streets of Perth. I'm actually really proud of some of the street art you see on the walls in Perth. And it's nice to see some new interesting pieces pop up every other week or so too. Makes the daily commute exciting! Haha!